Part mad scientist, part entrepreneur. Waynes roots goes back to 1978, where he contacted James Sholto Douglas from England. Once Wayne experienced hydroponic technology at the 1982 grand opening of the Epcot Pavilion Center he was hooked. A day in his shoes could consist of anything from designing & developing a new product design, to hand-manufacturing anything you might decide to buy in our online store. You may also have seen him in front of the lens explaining many of our hydroponic systems and technology in our online videos. Our roots truly run deep. Modularhydro.com has been custom designed & coded page by page. One brave soul steped up to the task of managing the online store & our main website which consists of everything from online resource librarys, to product reviews. When he's not in front of a computer screen designing & developing the site your looking at right now he's probably out backpacking in the wilderness some where. Our exclusive in house "Quality Control" inspector. Bentley will notify us via "meow" if our hydroponic systems don't meet his vigorous quality standards and he works for tuna. 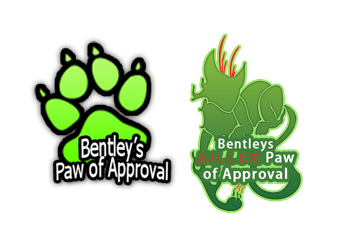 Bentley's "Paw of Approval" is then placed on every product to ensure these standards are always met. This cool HydroCat will ensure your system continues growing for years to come!